The CBT is not an environmental organization in the sense of advocating for a particular political agenda. This organization also differs in its activities from the various government agencies influencing this region. The difficulty in characterizing these kinds of institutions is perhaps why they are often labelled simply as NGOs (Non Governmental Organizations), which doesn't exactly clarify what they do. Rebecca identified three general objectives of the CBT: to promote research, education and training within the biosphere reserve. On the research front, this organization has funded numerous investigations into the social and ecological state of Clayoquot Sound and its inhabitants. They also maintain a library of archives and two research cabins (my impression however is that these are somewhat underutilized). It would be interesting to ask how (or perhaps whether) these research activities promote local sustainable development, as per the CBT mandate. Specifically, is the research conducted in Clayoquot Sound used to direct local policy? I raise this issue because there is often a disconnect between research and its application. Generally speaking, scientific findings often sit dormant after they have been collected. As a society we have come to accept this state of affairs, with academic and political worlds operating largely independent of one another. To its credit however, the CBT is taking steps to monitor community health. To this end, a range of health indicators as well measures for tracking them. Some of these are quite interesting (see below) in that they seem to address locally identified concerns. In terms of aligning research and policy, this project goes part of the way in bridging this gulf by identifying areas of research likely to have local significance. At the same time, this strikes me as quite an ambitious project. Are individuals really tracking all of these factors on a yearly basis? Who is responsible for processing and summarizing all of these data? I can imagine that it would take a team of researchers to undertake this project. I hope that this is indeed happening. I also look forward to seeing how these findings are employed to guide policy decisions. For example, what happens if some of these indicators suggest a decline in certain aspects of community health? Will such findings be taken seriously at the political level? If so, perhaps this area could serve as a model for tackling sustainability issues on a broader scale. The CBT is also active on the education and training fronts. For example, they provide generous scholarships to entering university students (one awarded to a First Nations recipient and one to non-FN). They are also supporting an initiative to build and manage greenhouses in First Nations communities in an effort to promote community health. 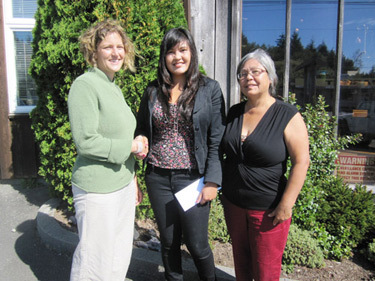 Rebecca Hurwitz, posing with Brittany Morgan (centre), recipient of the Nuu-chah-nulth Student scholarship, and her mother Anne Mack. Photograph by : Photo from Westerly News. It was an interesting lesson for students to learn about the CBT and its activities. In one respect it made them question whether there are similar organizations in their own communities and what exactly are THEY doing? In addition, I see this organization as expanding the realm of career possibilities for students, who might currently see their options as limited to governmental research agencies. One thing is for sure, organizations like the CBT will need a continued supply of bright and forward looking thinkers. The level of engagement with local communities is also something I can imagine many would find rewarding.